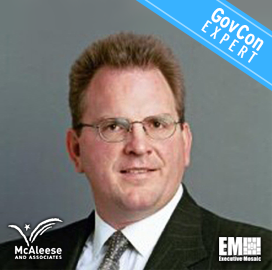 Consulting firm McAleese and Associates has released a report on key takeaways from the testimony of Dana Deasy, chief information officer at the Department of Defense, at a House Armed Services Committee subpanel hearing on artificial intelligence. Deasy appeared Tuesday before the HASC emerging threats subcommittee to discuss the newly established joint AI center and its specific missions. He said JAIC’s first project focuses on predictive aircraft maintenance and the second initiative deals with disaster relief, Jim McAleese, founder and principal at McAleese & Associates, wrote in the report. The CIO cited the center’s need for scale through common cloud, reusable tools and shared data and discussed how JAIC could address potential “stumbling blocks” related to data. “We need to have standards for datasets … to technically digest the data, and format the data,” Deasy told lawmakers. He also mentioned JAIC’s collaboration with the Defense Advanced Research Projects Agency to advance AI-related work. Deasy joined Lisa Porter, deputy defense undersecretary for research and engineering, during the House subcommittee hearing.